A 16 year old Slovenian flutist, Eva-Nina Kozmus won the grande prize at the Eurovision Young Musician's Contest this past week. Eurovision Finals (whole concert - let whole film load while you do other things, then come back to allow slider to move forward to where you wish to watch). Now we just need some more works like this that really thrill audiences!! More concerti for flute, PLEASE, you exciting composers out there! Listening to Kozmus I thought I had died and gone to heaven. What an astounding performance. I just started the flute 3 months ago and do play it fairly well but at my age (83) my fingers will never move that fast nor will I sound that beautiful ... but ... I won't quit trying. She is phenomenal flutist, has a great attitude, and has a very bright future! What is the make and model of flute is she playing? 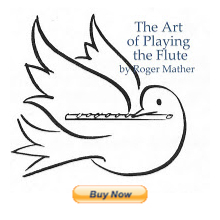 To find out what kind of flute a person plays you'd have to email them. You can't see it clearly on the video. Also, it doesn't matter really what make or model they play, since each player sounds like themselves regardless of what brand of flute they are playing. One can't obtain a particular flute hoping to make it sound like a particular player. That's been proven many times over the decades.